One of the features of Rock Ridge that really appealed to me from our first visit was the small bog that sat just offshore in Rock Lake. 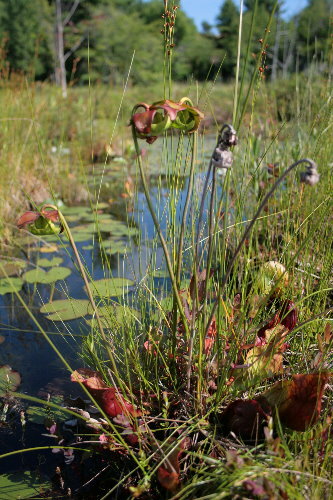 Bogs are intriguing habitats to me, perhaps because their unique conditions make them such a rare habitat type, full of interesting and different species found nowhere else in the region. Perhaps also part of it is that they are often very difficult to poke around in, unless one happens to visit a conservation area or such where they’ve built a boardwalk through it. The surface looks deceptively solid, but the thick bed of spongy peat and sphagnum moss is ill-suited for supporting 100-odd pounds of human pressure placed on a very small amount of surface area. Really, without a boardwalk, the only easy way to visit a bog is by canoe or kayak, and even then, you’re mostly limited to circling the perimeter. The access to Rock Ridge is by canoe, but to reach the actual site by water would involve portaging the boat across a short rapids. This ends up being more work than it’s worth, and by the time you’ve unpacked the boat, carried it around, packed it up again, and then paddled over to the shore by the site, you could have reached the same spot by foot and just have docked the canoe back at the rapids, which is what we’ve been doing. This means we don’t pass the bog by water, as I’d hoped, so I hadn’t had a chance to explore more closely. A couple of visits ago, however, during a slow period one morning, I clambered down the rocks to the water’s edge and scanned the edge of the bog with my binoculars. 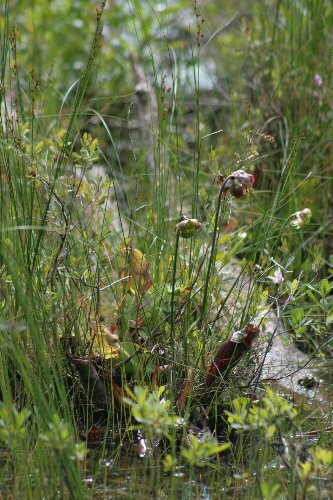 I was delighted to spot a couple of pitcher plants growing among the vegetation. Their red flowers projected above the grasses and sedges and caught my eye, but naturally I hadn’t thought to bring my telephoto lens down with me, and the wide-angle just didn’t have the reach for much of a photo. Last visit I took my telephoto down to try for a better photo, and while I got some passable shots, I was only so-so about them. We were in the middle of the move and internet downtime, so I didn’t have a chance to post them in Monday Miscellany. It turned out to be just as well, as our most recent visit was incredibly slow for birds, and Dan made the suggestion that he could hold the fort for an hour or so if I wanted to walk back and portage the boat over so I could putter around the bog a bit (he also asked me to get photos and GPS coordinates for a phoebe nest that will likely appear over at his blog, Frontenac Birds, perhaps his ulterior motive for letting me skip out for a couple of rounds). It didn’t take much to convince me. Good thing the canoe doesn’t weigh too much. The peat had built up under the water surface enough that I had some difficulty getting close enough to most of the bog for decent shots, but there was one spot where I had good access and I could pull up right next to the pitcher plant. That one plant got the works as a result. The pitcher plants we have here are Sarracenia purpurea. 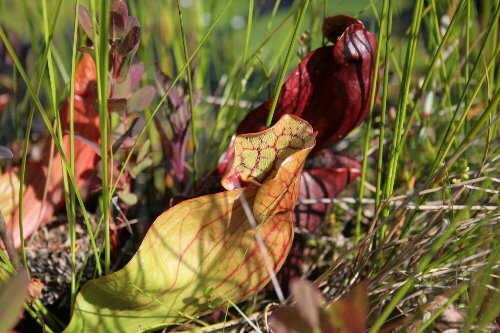 Because it’s the only species of pitcher plant to occur in Canada – the only one in the northeastern states, too – it’s often just called “pitcher plant”, but there are between 8 and 11 species (depending on who you ask) of Sarracenia in North America. The full common name for this one is Purple Pitcher Plant (a nice bit of alliteration there), taken from the species name purpurea, which means purple. The rest of the species are all restricted to the warmer climate of southeastern US. Some of the leaves are indeed purplish, but many are green with blood-red veins. The leaves are modified to form enclosed tubes, the feature that gives pitcher plants their names. Each is topped with a broad “hood”, well-developed in some species although somewhat reduced in the Purple, which functions both to keep out rain (which would collect and flood the tube, allowing insects to escape) as well as to guide unwitting insects to the trap. The leaves all grow from a fleshy rhizome, and plants can be propagated simply by dividing the root. Although some photosynthesis does take place to provide the plant with sugars, nearly all of its nutrients have to come from the prey it captures. The habitats that pitcher plants usually inhabit tend to be very acidic and nutrient-poor, with nutrients either leached away from the substrate the plant grows on by moving water, or the strong acidity of the environment severely hampering their uptake by the plant. Clearly the need for additional nutrients was the driving force behind the evolution of this special adaptation, though there is some debate about the process by which it happened. One theory suggests that the early ancestors of today’s pitcher plants simply had curled leaves, and eventually, through evolutionary time, the edges fused to become the tubes we see now. I checked a number of the pitchers to see if any had prey. A few had small gnats or other unidentifiable insects, but inside one was this unlucky firefly, still alive. 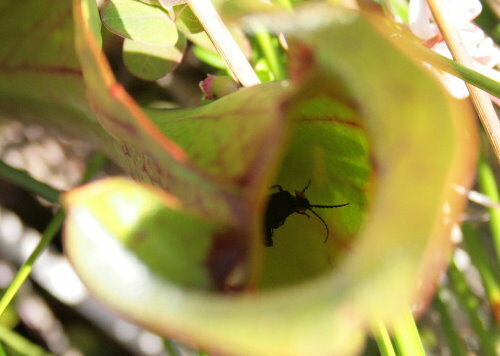 Pitcher plants use multiple cues to draw potential prey in. The first is visual, the combination of colour and shape. They also produce a nectar just under the inside lip of the tube, to tempt insects to lean in. And thirdly, they give off a distinct scent, although I didn’t try sniffing them. The inner wall of the tube is slippery, and while many visitors come and go without incident, an insect that leans in too far to get the nectar will slip into the cup. At least one species, S. flava, actually produces a compound in its nectar that acts as a narcotic to insects, affecting their balance. 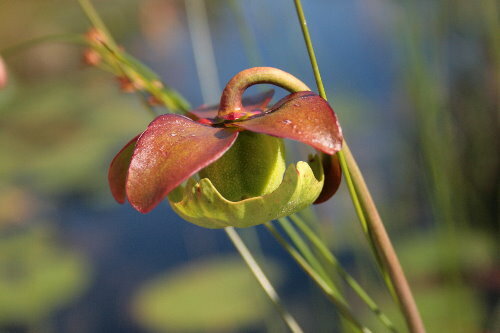 In the case of the Purple Pitcher Plant, the tube is filled with a watery liquid, but not all pitcher plants have that. The inner surface of the tube is lined with downward-facing hairs that make it extremely difficult for the insect to climb back out, and some species have grooves in their walls that further increase the difficulty. Eventually, the bug drowns. The lower half of the tube is lined with glands that secrete digestive enzymes that start work on breaking down the prey. When a leaf tube is young it will primarily use these enzymes for digestion. As it gets older, into its second year, however, bacteria and tiny organisms in the water increasingly become more important in that function. Some pitchers are also home to particular species of mosquito (Wyeomyia smithii) and midge (Metriocnemus knabi) larvae that are unaffected by the digestive enzymes. These larvae do the job of breaking down the larger prey items, and the pitcher absorbs the nutrients from their droppings. In return, the larvae get protection and an oxygen-rich environment (the oxygen being released into the liquid as a result of the plant’s photosynthesis). The flowers of the plant are just as unique as their method of securing nutrients. They nod from a tall stem, which hopefully keeps potential pollinators above any risk of falling in. The flowers themselves are formed of two cup-shaped parts – the red petals that curve down from above, and the green style that curves up from below. The style is part of the female reproductive organ, which in the average plant is long and narrow with the receptive stigma, what the pollen stick to, on one end and the ovary at the other. In the case of pitcher plants, the style is five-parted but fused together into one large surface, like an inverted umbrella. Where each of the umbrella’s “spokes” would reach the edge and form a point there is a stigma. The anthers, which produce the pollen, hang inside the central green tube. The umbrella-shaped style helps to catch pollen that may fall from these. Although it’s not demonstrated well in this photo, ordinarily the five red petals hang down in the gaps between the five pointed stigmas, preventing bees and other pollinators from entering there. The bees have to go in over the stigma, and in doing so brush on any pollen they may have picked up at the last flower they visited. They tromp through the fallen pollen on the umbrella surface, and up into the centre tube. When they turn around to leave, they can push the red petal out of the way and leave by the gap between the stigmas, easier than climbing over the stigma again. This way the plant avoids having the bees fertilize their stigmas with their own pollen, but also ensures that the bees have to pass by the stigmas on their way in. It takes five months for the seeds to mature. The seed pods split open, allowing the seeds to be dispersed. The seeds are hydrophobic, meaning they float on the surface of the water, allowing them to easily be dispersed to new sites on water currents. I suspect they probably travel between lakes on the feet and feathers of ducks, too. 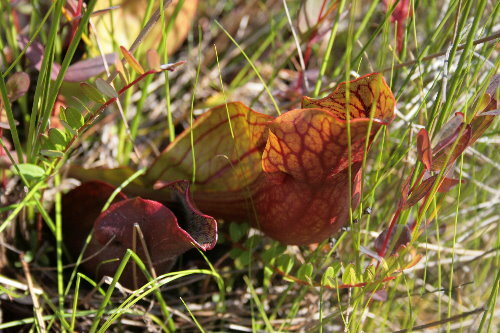 The Purple Pitcher Plant has been designated the official flower of Newfoundland and Labrador – its ability to persevere and thrive in harsh conditions a symbol for the province’s adaptable peoples. It looks like there is a bit of slow-moving water there. That would make it a fen. A bog has no water source but rain water. Thanks for the clarification, Barefootheart – I didn’t know what the exact definition of the two was, and tend to use them interchangeably. I’ll know for future use, now! Cool plant with a unique beauty. And a great natural history lesson to go with it. Thanks, April. And you know, in some places insects are considered a great source of protein… Though I happen to share your view regarding their appeal. Very cool. I was primed to enjoy your post by watching a show on tv yesterday about bog plants and planting them as unique house plants. :) I’d rather see them out in nature where they belong but it was fascinating. What a funny coincidence, Liza Lee! I agree it’s nice to see plants in their natural habitats, although of course all of our house plants grow wild somewhere. I’ve often thought it’d be neat to have a sundew as an indoor plant, but am pretty sure that because of its specific habitat requirements I would have trouble keeping it healthy. SWEEET! And thanks, barefootheart, for the term. ‘Fen’ is such an awesome word, and we’re now off to learn the difference between fen, swamp, marsh, and bog. Wetlands are an amazing group of habitats, so varied. I knew there was a difference, but hadn’t been clear on what the difference was. Hope you learn some interesting stuff! I’m completely in love with Sarracenia purpurea. I once found dozens of broken-off pitchers floating forlornly in a spot that had flooded when water levels rose rapidly. I took a couple of these shed pitchers home and stuffed the cavities with paper towels. They dried quite nicely, holding their shape and color once the towels were removed. The dried specimens later adorned one of my bookshelves, reminding me throughout the year of the bog from whence they came. Regarding terminology, as barefootheart points out, what is often called a bog might in many cases actually be a poor fen. (As opposed to a rich fen, in which the groundwater input is minerotrophic, allowing the site to support much greater plant diversity, and usually not Sarracenia). True bogs, or ombrotrophic bogs (isn’t that a great word??) receive only rainwater input. That was a pretty neat find, Matt. I read that you can actually propagate pitcher plants from root cuttings, so if you find a piece with a bit of root still attached you should be able to plant it and have it grow a new plant. Thanks for the clarification on the terminology. I knew there was a difference, but not specifically what it was. This site is at the edge of a lake that has both an inflowing and an outflowing stream, so I assume it has a fairly constant water exchange. The lake that provides the inflow is oligotrophic, however, so that may be the reason the fen is there. What a nice surprise. Last weekend I was at Cranberry Glades in West Virginia and saw these same plants. One of them had a spider living inside but I have not figured out which one yet. I really love bogs and enjoyed seeing this one through your words and photos. They’re such a unique habitat, Cheryl, I enjoy exploring them, too. Good luck figuring out your spider. Bogs are among my favorites. Perhaps if I had your gift for words, I, too, could share my love and fascination of this amazing habitat. Thanks, Karen. I think we can all share the fascinating things we find, each in our own way. And I think you write beautifully! Yikes! Beautiful meat eaters they are!